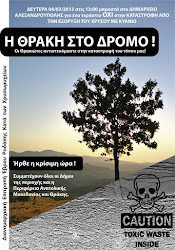 A delegation from northern Greece will be visiting Canada from May 26th to 31st, 2013, to alert Canadians to the current situation with Vancouver-based Eldorado Gold’s proposed Skouries and Perama Hill mining projects. The Greek delegation includes the Mayor of Alexandroupoli, Vaggelis Lampakis; Tolis Papageorgiou of Halkidiki; and Maria Kadoglou of Hellenic Mining Watch. The delegation will be speaking as representatives of the affected communities in Thrace and Halkidiki where there is overwhelming opposition to the mining projects. They will discuss the dangerous and violent climate currently surrounding the projects, and the corruption of the democratic process in the very birthplace of Aristotle. The delegation will also speak to Canada's increasingly negative international reputation, including the Canadian government's involvement through the Canadian embassy in Greece, funding from Export Development Canada and investments by public pension plans. It is indicative of how Canada is attempting to cover for destructive and conflictive mining projects using "corporate social responsibility" initiatives. For media enquiries (English-speaking) please contact Jamie Kneen, MiningWatch Canada, at jamie(at)miningwatch.ca; office (613) 569-3439; cell (613) 761-2273. Maria Kadoglou will be available to media in each city during the delegates' tour. Please arrange interviews with the three delegates through Jamie Kneen (contacts above). For more information - please see our articles "Gold and Democracy Don’t Mix – Eldorado Gold Faces Determined Opposition in Greece" and Background on Eldorado Gold’s Proposed Mines in Northern Greece. Αναρτήθηκε από ΧΡΥΣΩΡΥΧΕΙΑ στη ΘΡΑΚΗ STOP στις 11:11 π.μ.